Its Electronic Stability Control feature works in tandem with Electronic Roll Mitigation to actively and strategically reduce engine power and apply individual braking in order to prevent the wheels from lifting off the road, thereby reducing the possibility of a rollover. Another special feature of the new Dodge Journey is its four-wheel disc anti-lock braking system. This system is designed to monitor the speed of each wheel, providing superior control that slows down each wheel individually, keeping the entire vehicle secure during panic stops and during low-traction braking situations. The Dodge Journey provides you with the ultimate in responsive, smooth and quiet rides. 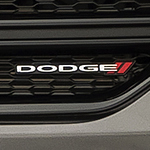 Why not experience its performance features for yourself at our Dodge showroom, where you can request a test drive.